"Broadway Re-Imagined" is the title of the new collaboration between local musical theater company Theater Latte Da and Hennepin Theatre Trust, which oversees the Hennepin Theatres (Orpheum, State, Pantages, and New Century), hosting many Broadway tours. 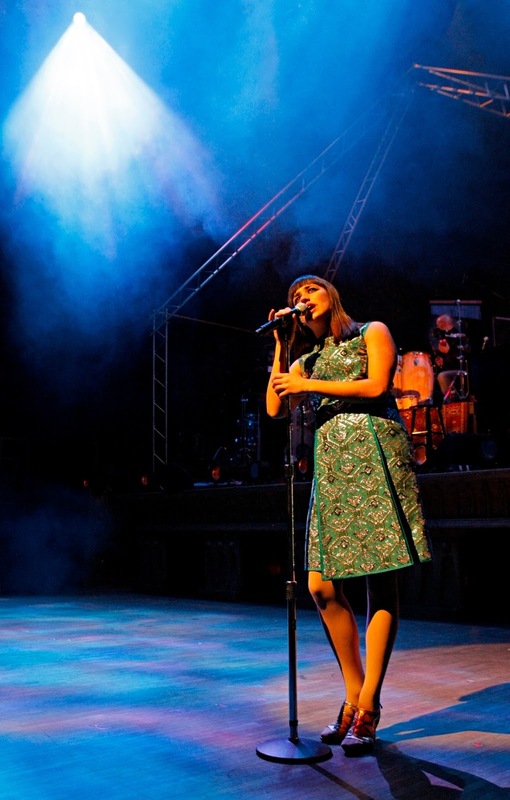 In the first product of the collaboration, the 2000 Elton John/Tim Rice pop/rock musical Aida is re-imagined as a rock concert with some fantastic design elements. It's a much bigger production than Latte Da usually does - bigger stage, bigger venue, bigger set design; Aida is a big musical with a big sound. But director Peter Rothstein still gives it that Latte Da touch with interesting and innovative choices, and I loved it. 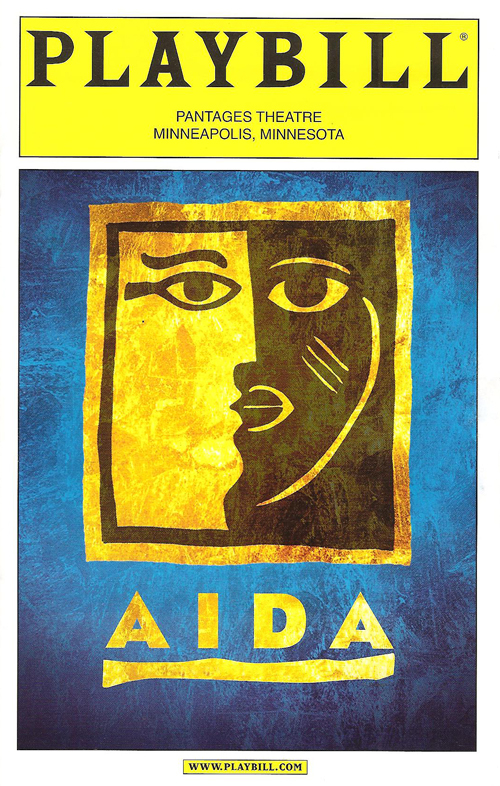 I saw Aida on tour and on Broadway on my very first trip to New York City in April of 2001, and while I don't remember much about the actual production, I've listened to and loved the soundtrack for twelve years. It's a fantastic (and Tony-winning) score, and it sounds amazing with the awesome onstage rock band and the (as usual) perfect cast assembled by Latte Da. The book is a little weak (maybe because it took three people to write it), but the compelling performances by the cast more than make up for it. All in all it's a wonderfully entertaining evening at the theater that's a feast for the eyes and ears. 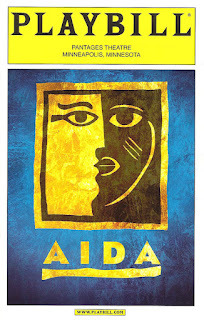 The musical Aida is based on the 19th century opera of the same name by Guiseppi Verdi. It tells the fictional story of Radames (a captain of the Egyptian army), who falls in love with Aida (a slave who is actually the princess of Nubia, a nearby nation with which they are at war), despite the fact that he is engaged to marry the Egyptian Princess Amneris. Radames' father has concocted a plot to kill the Pharoah and marry his son to the heir of Egypt, and thereby control the country. But he has underestimated his son's love for this "slave," Aida's desire to free herself and her people, and Amneris' strength in ruling in her own right. 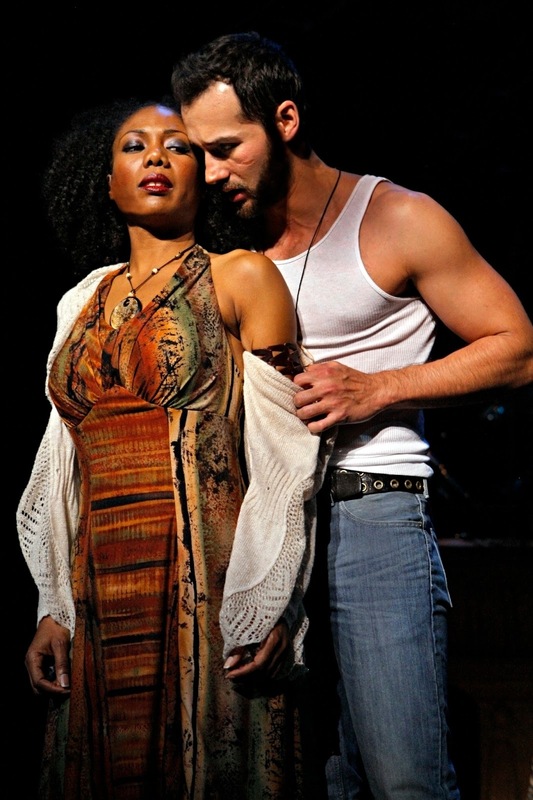 I've never been a big fan of "love at first sight" stories (especially of the slave/master variety), but it soon becomes clear that Radames and Aida are very much alike - both living in the shadow of their father, unable to live their lives freely as they choose. Amneris, despite initially seeming shallow, is a sympathetic character, making for a love triangle with no happy ending. The entire cast is superb, beginning with the three leads. Austene Van played a goddess in last summers A Night in Olympus at Illusion, and as Aida, she is a goddess. She has a regal voice and carriage that makes one wonder how anyone could not know that Aida is a princess. Her voice is stunning and her performance passionate as the woman torn between the man she loves and the people she would die for. Adam Pascal played Radames in the original Broadway cast (and also originated the role of Roger in my favorite musical RENT), and as much as I love him, his voice is not quite big enough for some of these sweeping pop ballads. So to hear someone like Jared Oxborough sing these songs is a revelation. He has a more musical theater type of voice with a gorgeous tone, but still gives it that rock edge. After listening to the OBC for twelve years, I finally know what these songs were supposed to sound like. Austene and Jared look and sound gorgeous together, with a believable chemistry. Last but certainly not least: the third member of our love triangle. Simply put, Cat Brindisi is a star. She has dabbled her toe in the pool of New York City, and it's only a matter of time before she's snatched up and taken away from us to become a Broadway star. She follows her incredibly moving performance as Wendla in Spring Awakening last year with another stunner here. Her Princess Amneris is a cross between Glinda and Cleopatra. She first appears shallow, enjoying clothes and shopping and frivolous things. But it's soon revealed that she's deeper than she seems, eventually growing into the role of leader of her country, and Cat makes this transition believable and sympathetic. One of my favorite songs from the show is the super fun "(Dress Has Always Been) My Strongest Suit," and Cat sings the crap out of it. In contrast, "I Know the Truth" is a sobering moment of realization, serious and beautiful. The show also features a couple of strong turns from supporting players. Nathan Barlow, a student in the U of M/Guthrie program, is one to watch. He impressed last fall in Measure for Measure with Ten Thousand Things (where there's nothing to hide behind), and he's quite charming here as the young Nubian man who recognizes Aida for who she really is and encourages her to fulfill her destiny. Ben Bakken as Radames' devious father is a scene-stealer with his two songs "Build Another Pyramid" and "Like Father Like Son." He really wails on these songs and sounds fantastic; it's now obvious to me why he won an Ivey for playing the title role in Jesus Christ Superstar (while I did see the show, it was on Ben's night off). The marvelous T. Mychael Rambo is underutilized in the ensemble and as Aida's father. He doesn't sing much except a few lines and a glory note, and even though I know Aida's father doesn't get a song, I was hoping they'd sneak one in somehow. It seems a shame to have T. Mychael Rambo in a show and not feature him! As I mentioned, the band is onstage for the entire show, which I always love. Jason Hansen does an amazing job leading this group of musicians that look and sound like a rock band. The whole show really plays like a rock concert, with characters occasionally singing into microphones. I particularly loved Jared singing "Fortune Favors the Brave" while hanging with the band, and the gorgeous trio "A Step Too Far," with the three members of the love triangle singing into mics at the front of the stage. 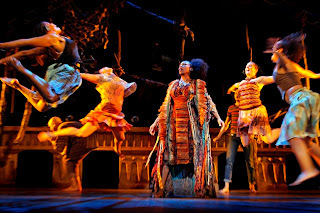 The choreography by Michael Matthew Ferrell is really interesting and diverse, from the jerky movements of the soldiers, to the "Walk Like an Egyptian" style of "My Strongest Suit", to the thrilling African style dance of the Nubian people. A really beautiful aerial performance seems slightly out of place, but does serve to emphasize the extravagance of palace life in comparison to what's going on outside of it. 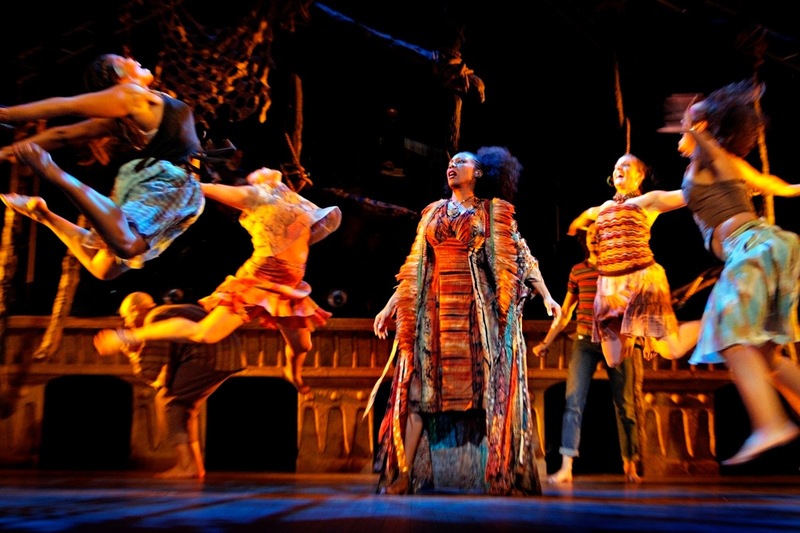 The set is spectacular, and when I looked in the playbill and saw the name Joel Sass (frequent designer/director at the Jungle, which has the best sets in town), I was not surprised. Backdrops and large pieces that move in and out, along with the use of screens and fabrics, represent various locations from the river to the palace. The costume design (Tulle & Dye) mixes modern with ancient, and Amneris' wardrobe is gorgeous and showy, and easily removable; her handmaids dress her up like a paper doll. This is not a historically accurate representation of ancient Egypt, rather it invokes the time period while matching the modern rock vibe of the score. (This is one of several elements that reminded me of Bloody Bloody Andrew Jackson, another modern retelling of history that mixes the old and new.) I'm going to see the show again in a few days with my theater group, and I'm glad, because there's a lot going on; it's really impossible to take it all in on one viewing. *Update: it has been announced that Theater Latte Da and the Hennepin Theatre trust will next be re-imagining a musical theater classic, Kander and Ebb's Cabaret. Peter told me that they were one of the first companies to licence the Sam Mendes 1990s revival version, which is much darker and grittier than the original, and incorporates some of the music written for the film. I cannot wait to see Latte Da's spin on one of my favorite musicals, coming January 2014.